Memorable moment, my 1st win on Ladies European Tour!
? Luister hier naar Anne van Dam na haar zege. Anne Van Dam from the Netherlands outlasted local star Yuting Shi in an enthralling final round duel to earn her first Ladies European Tour title at the Xiamen International Ladies Open in China. Van Dam, 21, from Arnhem, fired rounds of 70, 66, 67 and 68 to end on 17-under-par and one stroke ahead of Shi, who bogeyed the final hole at Orient Golf Club. The pair started the final round, played in hot and humid conditions, tied for the lead on 13-under-par before Van Dam took control with a birdie on the second hole. 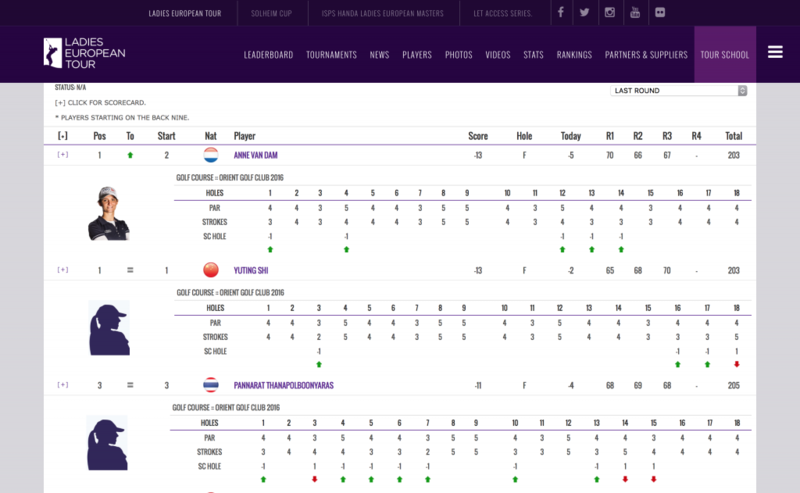 The tall and long-hitting Dutchwoman went two strokes ahead with an eagle at the par-5 fourth hole, but there was a two shot swing at the sixth, which Van Dam bogeyed and Shi birdied, before the diminutive Shi took the lead with a birdie on the seventh hole. The 18-year-old Shi, from Beijing, then bogeyed the 10th, but quickly recovered with a birdie at the 11th. Van Dam missed a great opportunity on the 14th but levelled the scores when she made a 40cm birdie putt on the par-4 16th hole. Drama ensued at the 17th when Van Dam drove left onto the 18thfairway, but she hit an excellent recovery shot and matched Shi with a birdie. The pair remained tied coming to the 18th tee, but Shi’s drive hit a tree and bounced back 30 yards down the fairway, meaning that she could not reach the green in regulation and took a pitch and two putts for bogey. Van Dam was able to make two putts from the back of the green for par to seal the victory, worth €45,000, in the event which was almost cancelled three weeks earlier due to a huge typhoon. Thailand’s Pannarat Thanapolboonyaras finished in third place on 14-under and Amelia Lewis of the United States was fourth. In a tie for fifth with Thailand’s Supamas Sangchan and Yu-Ju Chen of Chinese Taipei, Lydia Hall from Wales registered her best finish on the LET since her victory at the 2012 ISPS HANDA Ladies British Masters. Frenchwoman Valentine Derrey and Malene Jorgensen of Denmark shared eighth place with Indian rookie Aditi Ashok, who recorded her fourth straight top-10 finish on the LET. 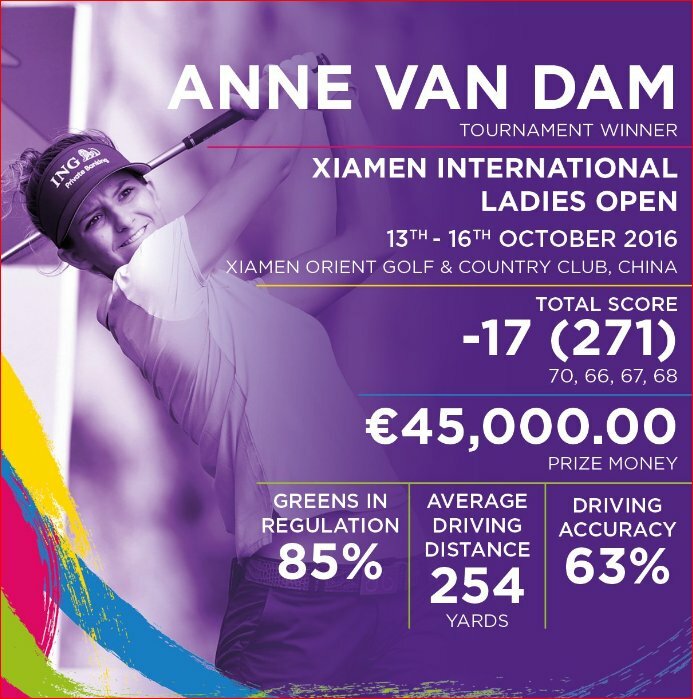 The 2016 LET continues with the Sanya Ladies Open in China, where Van Dam will be looking for a second straight victory in a fortnight’s time.
? Kijk hier NOS zondag 16 oktober 2016. Saturday 3rd round 67 [-5]. Saturday "Quotes from Ladies European Tour." Anne Van Dam from the Netherlands rattled off five birdies in a 67 on day three of the Xiamen International Ladies Open in China to catch Chinese teenager Yuting Shi heading into the final round. Locked at 13-under-par, the pair are two ahead of Pannarat Thanapolboonyaras, while fellow Thai player Ajira Nualraksa is three strokes further back alongside Liu Yan of China (below). She began her third round with a nerveless birdie on the first hole and added another at the fourth. A run of seven straight pars then preceded three birdies in a row from the 12th hole, establishing a one stroke advantage. Shi, however, birdied the 16th and 17th to go one ahead before three-putting at the par-4 18th for her first bogey in 54 holes. Van Dam’s best finish in two years on the LET is 12th, at the 2015 Helsingborg Open which she followed up in February with a tie for 12th at the RACV Ladies Masters. She has shown flashes of brilliance with two rounds of six-under and has won twice on the LET Access Series: at the 2015 HLR Golf Academy Open in FInland and at the Citizenguard LETAS Trophy in Belgium in July. Van Dam used her prodigious length off the tee to full effect in a six-under 66, which equalled her lowest round in two seasons on the Ladies European Tour. Anne Van Dam of the Netherlands fired a six-under-par 66 in warm and breezy conditions at Orient Golf Club on Friday morning to set the clubhouse lead at the Xiamen International Ladies Open in China. After her round, Van Dam said: “I’m obviously very happy. My swing felt very good yesterday but I made some silly mistakes. I had six birdies but four bogeys. Today I went out there trying to eliminate the bad ones and continue with the good ones and I got off to a really good start. I was five-under after eight and had a bad drive on 12, but that was the only bad thing. It could have been even lower. Met nog één ronde te gaan in het Xiamen International Ladies Open in China is Anne van Dam gedeeld eerste. Dat is te danken aan een sterke ronde in 67 slagen (-5). Anne van Dam begon ronde drie op de tweede plaats achter de 18-jarige leider Yuting Shi uit China. De speelster van Golf Team Holland maakte op de eerste negen twee birdies en toen drie birdies op rij, op de holes 12, 13 en 14. Op dat moment ging ze alleen aan de leiding. Van Dam eindigde haar ronde in 67 slagen (-5). Shi maakte op het eind van de ronde twee birdies maar ook een bogey en staat na 54 holes gelijk met Van Dam, op dertien onder par. Van Dam is tweedejaars op de Ladies European Tour. Haar beste resultaat is een 12de plaats: in het Helsingborg Open van 2015 en de RACV Ladies Masters van 2016. Ze won wel al twee keer op de LET Access Series: in 2015 het HLR Golf Academy Open in Finland en dit jaar de Citizenguard LETAS Trophy in België.